The absolute leading-edge in tuning tech. Can tune all strings at the same time for the fastest & most accurate tuning ever. Bright LED's & retina display. Recall of tuning settings. 'Tuning magnet' zooms in for faster high-precision tuning. BonaFide Buffer tech balances your impedance. You must cable in, so you can't use it on an acoustic guitar. This one will spoil you, causing you to abandon your other tuners. The clip-on polyphonic tuner that reads the vibrations off your headstock. Convenient to use & easy to share among your band on stage in a hurry. Extremely compact. Screen rotates like on a smart phone. Looks great & inconspicuous. From pocket to guitar & back quickly. Very accurate. Polyphonic mode shows no letters, only lines for you to target. Single string mode does show letters if you need it. This workhorse is a chromatic tuner & fantastic practice tool, providing a metronome, tone generator, BPM tapper, & much more. Can accept a TRS input for silent tuning on-stage or you can use the microphone for an acoustic. Various tuning modes & rhythm patterns. Easy to read screen. Although perfect to throw in your pocket for covert tuning on stage, it'll require you to jack out of your amp and plug into the tuner. 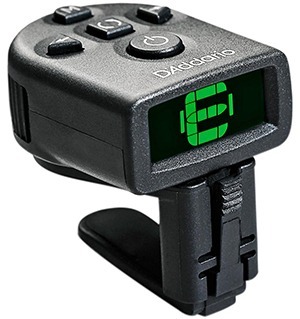 If there is one tool you will absolutely need as a guitar player, it's a guitar tuner. The importance of having your instrument in the right key can't be emphasized enough. Additionally, guitars going out of tune during use is something everyone has to deal with. So it's a non-negotiable skill; you will have to learn to tune up and how to do it fast. As a matter of fact, getting a tuner and learning how to properly tune a guitar should be among the first items on your to-do list as a beginner. If you build that habit right from the start, your life as a guitar player will be much easier later on. Tuning a guitar requires a precise tuner that is also easy to use. When you are on stage, you really need to be able to get that pitch corrected in a matter of seconds between songs and sometimes during them after a hard bend. Today we are going to show you a number of awesome guitar tuners that will get the job done in various ways so you can figure out what's right for you. There are many types of these devices out there, each created to optimize efficiency in their own way. You can even get tuner apps and DAW plug-ins that do the same thing, but we won't get into those in our guide since they aren't applicable to you in the middle of a performance. Let's get started with our first category, the handhelds, and see what we've got to share before moving on to every other type of tuner out there. Handheld tuners are among the oldest designs still around to this day. You'd think the older form factor would eventually be frowned upon, but handheld tuners have been the favorite up until recently. They held their spot at the top for so long because more advanced tuners were generally much more expensive. However, the situation has changed since then. You still can't go wrong with a handheld in most situations. A handheld tuner is basically a little box with an 1/4" TRS input, a display, and a couple of buttons depending on the design. These are usually battery powered. To use a handheld tuner, you have to plug in your electric guitar, although most of them have built in microphones. Just keep in mind that those microphones are not that accurate. If it were up to us, we would say that handheld tuners are most appropriately used as backups. You can't really use them to correct your tuning on the fly in the middle of a song like you can with a pedal, but you can quickly pull one out of your pocket and plug in between songs to get some very accurate tuning done fast. I'd consider having one of these around and a spare battery a must for your gig bag. They're especially convenient at home when there's no pressure to tune in a hurry. Let's check out a couple of great options from this category. The Korg TM50 has a lot of features to offer that have been refined over time. For the most part, you are getting a similar set of features you'll find on a lot of other tuners, but in addition you're getting other useful tools that may be missing elsewhere. The metronome makes this a great practice tool as well, including a tap tempo button to help you recognize various 'beats per minute' speeds. The display they've used is simple, large, and easy to read. It shows all the necessary info, and is rather precise. In terms of tuning the guitar, you'll use the 1/4" TRS input as well as a built in microphone for acoustic guitar players. It even has headphone outputs with a 'sound back' feature to help you practice pitch recognition. The absolute greatest thing about Korg TM50 is its bargain price. 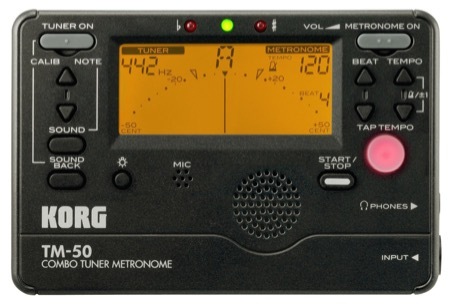 It's a perfect main or backup tuner that actually works. 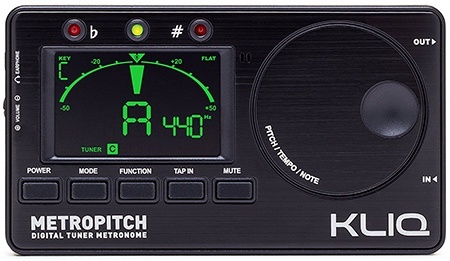 The KLIQ MetroPitch is an awesome tuner that's capable of much more than just tuning your guitar to the correct pitch. It is also a metronome and a tone generator, like the Korg above. KLIQ has basically used the same old design layout for this model. Both of these models include the extra tools that make them the obvious picks over other lacking options out there. The centered display makes tuning a guitar super easy with its TRS input and built-in microphone, along with very simple controls. What's awesome about this model is that not only do you get half-step notes but also the frequency of the note your hitting. If you look at the right side of the device, you will see a large jog wheel. This is what you use to set tap tempo and control the tone generator. The MetroPitch build quality is more than decent. KLIQ has used a good choice of materials and everything is built in a way that inspires confidence that you're not going to break it. If you care about keeping it scratch free it even comes with a nice cloth slip-case. It uses two AAA batteries which will last you a relatively long time, but always keep some spares around. We have seen the old standard, the handheld. Now it's time to check out what most people use today. 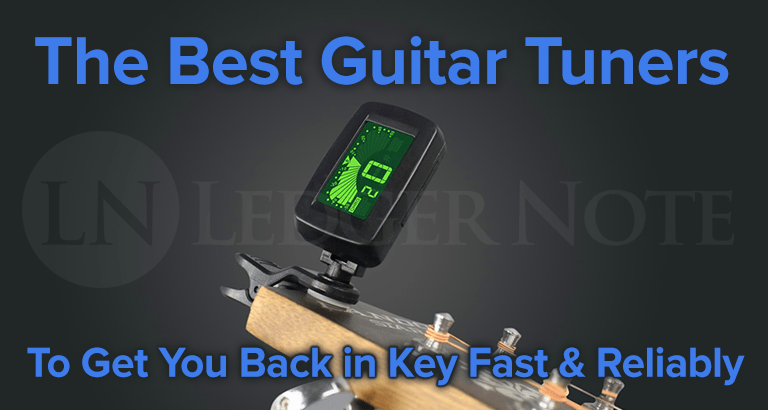 Clip-on tuners are simple, effective, and incredibly convenient. We are talking orders of magnitude simpler compared to handheld tuners, but less robust. As their name says, clip-on tuners are clipped onto a headstock of a guitar and can be left there indefinitely, although that'll look goofy during a live performance. There are no cables to worry about nor anything similar. You can perform with them on the headstock and not suffer any consequences. The way these tuners work is by picking up vibrations straight from the headstock when you strum a string in isolation. There are no microphones involved, which makes them a perfect choice for noisy environments like stages. You just need to make sure you have a spare battery around. These are cool and inconsequentially priced, so there's no real reason not to have one around. But before you think these are the be-all, end-all, wait till you see the polyphonic and pedal tuners up next. An average clip-on tuner is fairly accurate, cheap, pretty reliable, and make great gifts. Speaking of which, here are two clip-on tuners that have proven to be really capable. Yep, we have another Korg for you today. This brand is one of the few go-to choices out there due to the level of precision they offer. Korg's PitchCrow is a smaller and more versatile version of its predecessor model. It brings a large colored LCD display that makes tuning the guitar an easy task even in low light conditions. The entire thing is mounted on a adjustable arm that leads to the actual clip. This way you are able to find the perfect position of the display that gives you the best visibility. That is actually one of the most important features on any clip-on tuner. With this one, if you clip on at a weird angle you can just move the display without losing time readjusting the clip. Lastly, the PitchCrow has specialized modes for both guitars and bass guitars, ensuring that you get perfect readings. Its level of precision simply trumps most of what is available in this segment of the market. Here's another awesome clip-on tuner, but slightly different from our previous pick. The D'Addario NS Micro was designed to stay on the guitar for as long as you need it to. This becomes even more apparent when you see just how tiny it is. D'Addario went for minimal footprint and a lowest possible profile. You can clip this one with the bulk of the tuner on the back of your headstock so it's not an eyesore for your audience if you choose to leave it on there. The tuner itself features a small display that shows large letters indicating which note you playing. There are no dials or gauges, nor frequency indicators. To navigate within the tuner's settings, there is a number of buttons on top of the chassis. Interestingly enough, D'Addario has implemented a visual metronome into this build, making it even more versatile. With that said, the absolute best thing about the NS Micro is its precision. For such a small and relatively affordable tuner, you are getting incredibly precise readings. This goes for both acoustic and electric guitars. If you appreciate simplicity and minimalism that you can trust, this might be the clip-on for you. If you were wondering what's the latest and greatest innovation in guitar tuning, this is it. Polyphonic tuners are relatively new and still in development. Even so, the stuff we have seen so far is very promising. We can thank TC Electronic for these masterpieces. The miracle is in how they work, which provides the fastest tuning possible. One of the universal truths about using a guitar tuner is that you have to tune each string one at a time. That's how it's been done forever, but not any more. With polyphonic tuners, all you have to do is strum all of the strings at once, and it tells you which string needs to be tuned and how much. It's truly revolutionary. Naturally, the main benefit of having a polyphonic tuner is the time you save going over your key one string at a time. With that said, polyphonic tuners come in a variety of shapes and forms, including some we have already covered. Our two favorite options are below. This is the classic pedal tuner put in 'God Mode.' The TC Electronic PolyTune 3 is the leading edge innovation in tuning and is still priced within the expectable bounds. Compared to the clip-on version we'll show you below, this one is far more robust. You'll be stepping on it, after all. It's a professional piece of work, no doubt. The principle of operation is as described above, where you can strum a single string or all six and get a full reading immediately. Since cables are necessary, you won't be able to use this on a standard acoustic guitar. However, if you have an acoustic-electric, you are good to go. With improved analog circuitry and an all new retina display, the TC Electronic PolyTune 3 offers perfect clarity. The precision of measurement is impressive to say the least. Whether you are in polyphonic mode, or standard mode, your tune will be perfect. Some of the coolest features are the total recall memory of whatever tuning you're using so you don't have to keep setting up your pitch references and tuning modes, and the 'tuning magnet' here increases the precision of the tuning. It essentially 'zooms in' visually as you get closer to your perfect pitch. This way, you can make tiny movements for exact precision instead of over-shooting and under-shooting on repeat and getting frustrated. 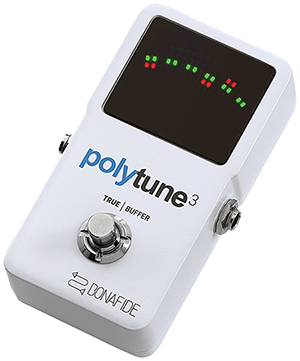 The PolyTune 3 also adds TC's buffer technology from the BonaFide Buffer pedal into it, which is basically like getting a free pedal. Since you run into the tuner first before the rest of your gear, the buffer balances your high impedance input (without adding noise) to avoid the dreaded high-end frequency rolloff, harmonic distortion, and inconsistency from other pedals that accumulates once you run through a ton of pedals and cables. It's an added bonus that your tone will thank you for over and over. 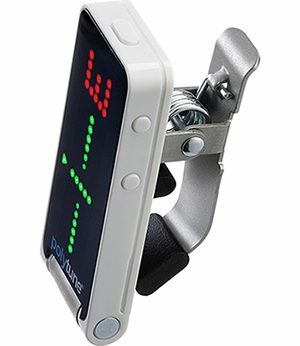 The PolyTune Clip from TC Electronic is their clip-on version of the polyphonic guitar tuner above. It does everything the original does, only in a much more compact form factor. TC Electronic has always had a sense of style, which you can definitely see on this model. With a white chassis and a black display, it looks amazing and feels like the futuristic technology that it is. The form factor is super compact, making it almost invisible when installed on a guitar. The clip is strong, providing plenty of support, while the information read on the display makes perfect sense. We say that despite there being no letters or numbers used in polyphonic mode. When you flip the screen up from its resting position, the readout on the display will even flip over if you have it backwards, like the screen on your smart phone when you rotate it. What is far more important is the accuracy. TC Electronic has gone above and beyond to produce a nearly clinical piece of accuracy here. No matter what gauge of strings you are using, or if you strum one or all of them, the PolyTune Clip will give you extremely accurate readings. With that said, it's a really handy tool to have on stage and might even look cool to the audience to see unlabeled lights and wonder what you're doing. When you step into a more professional territory, the first type of tuner you will run into is a pedal tuner. As you have probably figured out by now, pedal tuners come in form of guitar effects pedals. The idea is that you link one of these early in your signal chain on a pedalboard. This way, whenever you need to check your key, all you have to do is tap that foot switch and you are good to go. The only real downside to pedal tuners is that you don't get support for acoustic guitars. A cable is a must in order to get any feedback. That's inconvenient for some, but also very beneficial to all electric players who can get a true read without dealing with microphones and vibrations. A pedal guitar tuner is generally going to be much more precise than other types of tuners due to tapping right into the source. Their robust build makes them durable while the pedal format makes them practical. It's nice to have them fit right in with the rest of your effects processors. Here are some of the best pedal guitar tuners. Boss is one of those names that warrants authority when it comes to guitar effects and accessories. 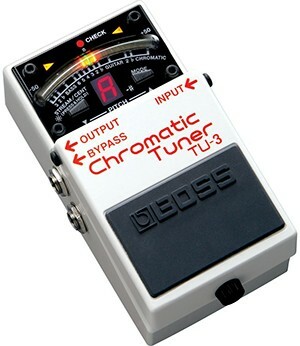 The Boss TU3 Chromatic Tuner is one of the most robust, precise, and practical options on the market. The TU3 comes in the same chassis as the rest of Boss pedals do, with only the top part being different. Instead of knobs and buttons, you get an analog gauge and a small digital display. The analog gauge is there to tell you how far off the actual pitch you are, while the latter indicates the pitch you're closest to. This tuner supports both guitars and bass guitars, while there's also a drop tuning mode available. You can even set it to 'guitar mode' and tune by string number. Overall, the Boss TU3 offers great visibility in bright as well as really dark conditions. It works great in a signal chain and comes with a bypass output so you can be heard while you tune, if you think the crowd will like that. This is as real as it gets in terms of reasonably priced precision pedal tuners. 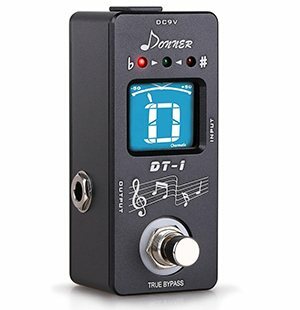 If you are looking for something smaller and preferably more affordable, the Donner DT-1 is the way to go. This tuner comes in a mini pedal format and features a basic array of features. Donner wanted to design something that was accurate, simple to use, and compact so it's not sitting on your pedal board as one of your main effects, eating up precious real estate. It's fair to say that they've achieved that goal. The user interface on this tuner consists of three elements. You have the foot switch, an LCD display, and a half-step indicator above. One awesome thing is that Donner has actually included a true bypass, so you don't have to worry about signal bleeding and similar nuisances. When it's off, it's off! In terms of precision, you are looking at a 1-cent margin of error, which is more than acceptable for nearly any tuner, especially at this bargain cost. Lastly, the Donner DT-1 uses a 9V DC power supply, meaning that it will be on and available whenever you need it. That's the nice thing about pedals over clip-on and handheld tuners that run on battery power. One of the more unique types of guitar tuners are sound hole tuners. Designed specifically for acoustic guitars, these tuners don't work with electric guitars. The idea behind this design is that you attach the tuner on the edge of the sound hole, where it can pickup the most accurate readings from the guitar. Most of them are constructed in a way where the display is in a direct line of sight with the user while playing, but not visually obtrusive to the audience. There are two types of sound hole tuners out there. You have the curved ones and the clip-on ones, although both have to clip onto the top of the guitar. The curved tuners are a bit more complex but more accurate, and it ultimately comes down to user preference. Today we are going to show you an example of each. The models we have chosen have proven their worth numerous times by now, making them solid choices regardless of your taste. Let's get to it. The Korg RP-C1 Rimpitch is one of the better sound hole tuners on the market. 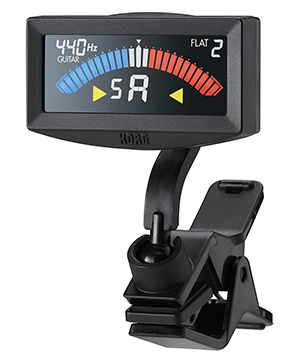 Korg has made this chromatic tuner about as versatile as possible. It works like a clip-on by detecting the vibrations of the string that are resonating along the face of the guitar. Since these types of tuners need to be mounted on the guitar top, the thickness of the top matters a lot, although they tend to fit most standard acoustic guitars. You'll want to make sure the sound hole is around the typical 100 millimeters in diameter due to the curvature of the tuner. With the Rimpitch, you don't have to worry too much about that. The mounting mechanism is made of softer plastics which ensures that your instrument won't be scratched during use. The display consists of a pitch scale followed by a precision indicator. Overall, it's a very simple design that's fast to use once you grasp the process. Where the Korg Rimpitch stands out is the level of precision. It's piezo pickup is fast, responsive, and accurate. The type of performance it offers is good enough for both professional and casual use. If this model looks awfully familiar, it's because D'Addario used a very similar design for all of their NS tuners. Compared to the curved models, this micro tuner is much more stealthy. The principle of operation is more or less the same. All you have to do is mount it to the bottom part of your sound hole where you can see it and the crowd can't and you are good to go. 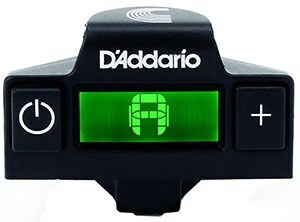 The display D'Addario has used is small and simple, showing only the most critical info. It is extremely easy to mount and completely non-intrusive. The tab that actually comes into contact with your guitar features a soft pad which prevents damage to both the tonewood and finish. Since it is so tiny, you can use the D'Addario NS Micro on any instrument that has a sound hole, including ukuleles. The diameters don't matter at all. It'll pick up any vibration through its piezo transducer. This is a great alternative to a clip-on if you don't want your audience to realize you're not tuning by ear. As expected, rackmount tuners require a cable-fed input in order to work. In other words, you won't be able to tune your acoustic guitar with these. The main benefit of using a rackmount tuner is the high precision they offer and the abundance of features. If you're using mostly rack gear then you'll find that running through run of these in bypass mode most of the time means you can tune up with the press of a button and then jump right back into bypass mode. Here are two really awesome models we would like you to check out. This Rocktron Versatune unit brings a robust and insanely accurate solution to all your guitar tuning needs. There are couple of things you should know straight away. It's a two channel tuner. It features two modes of tuning and it comes with plenty of preset tunings to choose from. Those two modes of tuning we have just mentioned indicate levels of precision. You have the standard mode where it acts as any other tuner, but then there’s the precision tuning mode. The latter implies increased sensitivity which is necessary if you want to minimal deviation. Rocktron VersaTune features hundreds of preset tunings which you can access using the small LCD display. With a press of a button, select the one you want and the tuner will instruct you how to dial everything in. You can tune up a mandolin, banjo, pedal steel guitar, bass, dulcimer, and nearly anything you can run a cable out of. It also features modes for alternative tunings too, which is nice for the metal-heads out there. What makes the Korg Pitchblack Pro such a great deal is the amount of features it offers at an affordable price. The tuner features a sleek, all black chassis with blue illumination leading to a centered green target. On the far left side of the interface is where you find your pitch indicator, while the remainder of the surface is used by a massive visual meter. The cool thing about Pitchblack Pro is how easy to use it is. It doesn't come with preset tunings like our previous pick (making it cheaper for standard players), but it has a couple of tricks up its sleeve. For starters, the meter scale can work as a strobe, half strobe, or you can choose regular illumination. On top of that, Korg has included a cable checker that can test your cables for any faults. In terms of precision, this thing is surprisingly good. If you want an affordable rack tuner, this is it. It's puts on a nice light show for the crowd to wonder just what the heck you've got going on in your rack. Guitar tuners are by far one of the most important tools you can have as a guitar player, especially when you're first learning how to play. Going into a performance with a perfectly tuned guitar is a must. Having the ability to adjust that tune on a moment's notice is important as well. The models we have shown you today represent the best in their respective categories. All you have to do is figure out which format works best for your needs and your type of guitar. We highly suggest that you get a clip-on tuner, if nothing else then as a backup. It's always good to have some redundancy. But, if you can swing it, we do consider the polyphonic pedals among the best guitar tuners ever.